Tamil New year is a very important festival of Tamilians and is popularly known as Varusha Pirapu or Chithirai Thirunal. It is the first day of the Tamil calendar month Chithirai and falls on 14 the April. Chithirai is the start of spring season where mango and Neem trees will be full of flowers and fruits. 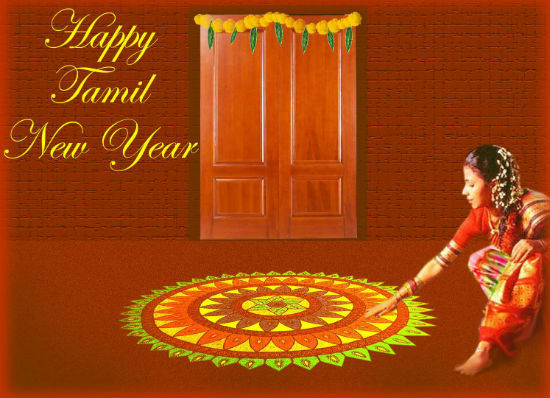 The Tamilians all over the world celebrate this festival with great fervor and galore with their Traditional dishes. In this wonderful occasion, the Hindus cook 6 different tasty foods sweet, bitter, sour, salty, spice and umami. Payasam, Paruppu Poli, Mango Pachadi, Paruppu Vada, Veppam Poo Pachadi, are a must in the menu. Here are the recipes of these delicious dishes. Try and savor with your family. This tasty dessert is a special dish prepared on the day of Tamil New Year. Pressure cook the Chana dal (Kadalai Paruppu) and keep aside. Roast Rava in a kadai until the raw smell disappears and add to the cooked Chana dal. You can also add roasted, powdered raw rice to the dal to get thicker. Grind the grated coconut with 1/4 cup of water and squeeze the milk from it. Add coconut milk to the above mixture and boil. Stir regularly. Add jaggery and cardamom powder. Mix well and let it boil for some more time. Roast raisins and cashews in 1 tsp of ghee, garnish the payasam and serve hot. It is a mouthwatering sweet prepared with Kadalai paruppu and jaggery. Tamilians prepare this on all special days especially on the Tamil New Year day without fail. Take maida and add 1 tsp turmeric powder, 1 tbsp vegetable oil. Mix well and with little water make it into soft pliable dough. Cover it with a soft cloth and set aside. Boil Bengal gram (Kadalai Paruppu) until soft. Drain and cook it along with jaggery, coconut and cardamom powder in a sauce pan. Cook till all the ingredients come together into one harmonious mass. Roast cashews in ghee and add it to the mixture. Now, make small balls of dough and roll them out into small circles. Make small balls from the jaggery mixture and place it in the middle of the dough. Cover the dal lump and press it down into a flatbread. Now roll it out carefully. Place it on a griddle, add ghee and cook until golden brown. Now your delicious puran poli is ready. This spicy, crispy snack is a special snack served with the lunch menu of the Tami New year. Take 3/4th of chana dal, 2 tbsp of urdal, and 2 tbsp of Toor dal and mix well. Soak in water for 3 hours and strain well. Keep it for 1 more hour. Keep three tablespoons of the mixture in a bowl and grind the rest with salt and a pinch of asafoetida without adding water. To the ground mixture add finely chopped onion, green chili, ginger and coriander leaves. Mix well. Heat the oil in a kadai. Make small rounds of the mixture, flatten it and deep fry. Take it out when it turns brownish color and serve hot. Manga Pachadi and Veppam Poo pachadi are the special dishes prepared on this auspicious day. This is a must in the menu. This pachadi reminds us the six emotions (Happiness, Disgust, Fear, Sorrow, Anger and Surprise) symbolizing with six tastes Sweet, Sour, Salt, Bitter, Pungent and Astringent-in the year ahead. Roast fresh Neem flower without oil till it turns to golden brown and powder it. Take tamarind about the size of a lemon and soak into the water. Make a thick extract of tamarind and add salt. Boil for 3 minutes. Then add jaggery and boil for 2 more minutes. Make a thin paste of rice flour with water and add it to the boiling mixture. Boil till it becomes thick and remove from the heat. Add Neem flower powder, tamper it with mustard seed, red chilies, and curry leaves and asafoetida. Without this sweet pachadi prepared from raw mango, Tamil New Year special recipe would not be completed. Raw mango has a high content of iron and is good for anemia and serve as antioxidants. Peel the mango and cut into 1″ pieces. Add turmeric, salt and cook in ½ cup of water. Once mango cooked well, add jaggery till it mixes well with the mango. Make a thin paste of rice flour with water and add it to the mango mixture. Boil for 1 min and remove from the heat. Tamper with mustard seeds, red and green chilies. Get off to a good start with these delicious New Year’s Recipes. Try these tasty and scrumptious recipes and celebrate Tamil New Year with great zeal. Feel free to comment or share your thoughts on this "Celebrate Tamil New Year's Day with these Delicious Recipes" article from Awesome Cuisine.